Many of you have heard mention of the Reverend Doctor Nevil Maskelyne (1732-1811), Astronomer Royal, who during the period 1774-1776 camped on the sides of our clan mountain – Schiehallion – while conducting his experiments to determine the weight of the earth. To undertake his observations, Maskelyne established a base camp on the lower ridge of Schiehallion where he stored his supplies. This camp was set up by his assistant Duncan Robertson. Unfortunately one evening, the storage hut burnt to the ground and in that hut was Duncan's fiddle. Reverend Maskelyne promised to send him a new one on his return to London and some time later, a new fiddle arrived. Duncan was delighted with its beautiful appearance, the grain of its wood and its sweet tone. He composed a tune which he named after his new fiddle, 'The Yellow Lady from London'. Many years later, the fiddle was still a family possession and being played by another Duncan Robertson. This Duncan went off to Australia to make his fortune and left the fiddle in the good care of his mother. One day she lent it to a Rannoch man, so he could compete in a fiddling and dancing competition in Liverpool. Unfortunately his man ran short of money and pawned the fiddle so he could return home. On arriving home he incurred the understandable wrath of Mrs. Robertson and her neighbors. The neighbors raised the necessary funds to redeem the fiddle and another Rannoch man was entrusted to go to Liverpool and bring it home. On his way home, Alistair Phiobair fell and broke the neck of the fiddle. Returning to Rannoch, he gave the fiddle to Duncan Robertson's brother who was able to repair the neck and the fiddle was as good as new. Many years later, Duncan arrived home from Australia and was delighted to find the fiddle was still in good condition. He gave it to his brother's second son, a young fiddler also named Duncan. 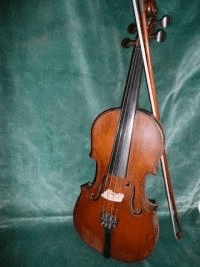 The fiddle was eventually donated to their clan, so if you happen to be visiting the Clan Centre at Bruar next year, you will be able to see this same fiddle again on display. Now you know its history.